Zane Keighran is a neat prospect who was a little unlucky with injury wiping out the second half of his season. He is a lovely kick of the football when he can win it on the outside, but he is also not afraid to back himself in at a contest and go hard. He . has the tenacity to win the ball at the coalface, but still needs to build strength so he can have more of an impact at stoppages and not be pushed off by stronger opponents. 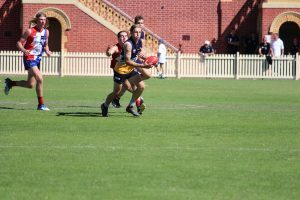 He is nicely balanced, can also play down back or up forward – he played in defence in the TAC Cup and up forward at the National Under 18 Championships – and his high work rate allows him to cover plenty of ground. Keighran is equally as talented at cricket, and it will be interesting to see how he fares at the upcoming drafts as he has that natural talent, he just has missed a fair bit of footy in the back-end of the season.